You are cordially invited to the next art exhibit at Mind Flirt Gallery and Studio (located inside the Magoski Arts Colony), entitled “In Transit” featuring works by Paul Tran. The opening reception is Friday, October 5th from 6-10pm during the Downtown Fullerton Art Walk. 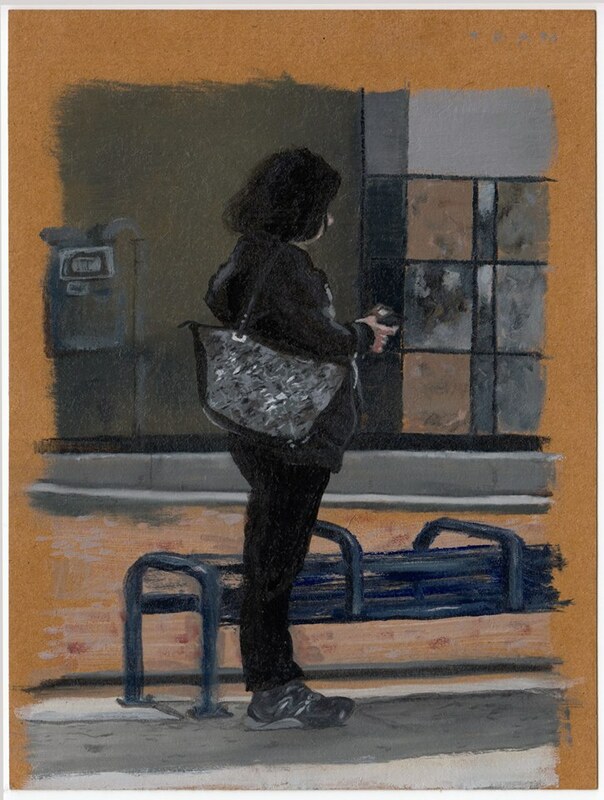 These paintings depict people that I see on my commute to and from the Magoski Arts Colony. Although they are strangers to me, I have tried to capture their spirit, personality, and individuality. Through these fleeting glimpses of people at bus stops, one can see that whether we commute for work or for play, we are all in transit in our lives. My work focuses on intimate moments of reflection, psychology, interiority, and quietude. Through my current portraiture and figurative work, I like to explore the different textural qualities and mark-making aspects of oil painting. I owe much of my creativity to my parents, who fostered and nurtured my love of art and music from a young age, and whose left-brain and right-brain leanings inform much of my process and my work.